On a crisp fall evening in 2006, Dr. Sylvain Martel held his breath as a technician slipped an anesthetized pig into a whirling fMRI machine. His eyes stared intently at a computer screen, which showed a magnetic bead hovering inside the pig’s delicate blood vessels. The tension in the room was palpable. Suddenly, the bead jumped to life, hopping effortlessly down the vessel like a microsubmarine heading to its next target destination. The team erupted in cheers. Martel and his team were testing a new way to remotely steer tiny objects inside a living animal by manipulating the magnetic forces of the machine. And for the first time, it worked. Scientists and writers have long dreamed of tiny robots that navigate the body’s vast circulatory system, like space explorers surveying the galaxies and their inhabitants. The potentials are many: tiny medical microbots could, for example, shuttle radioactive drugs to cancer clusters, perform surgeries inside the body, or clear out blood clots lodged deep inside the heart or brain. “The dream is the Fantastic Voyage,” but with bots instead of people, says roboticist Dr. Bradley Nelson at ETH Zurich, referencing a classic science fiction movie wherein a team of people are shrunken down and travel through a person’s bloodstream to perform brain surgery on a moribund intelligence agent. For now, medical microbots are still mostly fictional, though that’s set to change within the decade. Writing in Nature this week, Drs. Mariana Medina-Sánchez and Oliver G. Schmidt at the Leibniz IFW in Dresden, Germany turned away from the big screen to nanoengineering labs, setting out priorities and realistic tests to bring these tiny surgeons to life. Medical microbots are part of the medical field’s journey into miniaturization. Back in 2001, an Israeli company introduced the PillCam, a candy-sized plastic capsule that harbored a camera, batteries and wireless transmission machinery. While traveling down the alimentary canal, the PillCam periodically beamed back images wirelessly, offering a more sensitive and less toxic diagnostic measure than traditional endoscopy or X-ray imaging. Size wise, the PillCam is gigantic for an ideal microbot, making it only suitable for the relatively wide tubing of our digestive system. The pill was also passive, unable to linger at interesting locations for a more detailed survey. “A true medical microbot must propel and steer itself through an intricate network of fluid-filled tubes to tissues deep inside the body,” explains Martel. The body, unfortunately, is rather hostile to outsiders. Microbots have to be able to survive corrosive gastric juices and paddle upstream in the blood flow without the convenience of battery-powered motors. Labs around the world are figuring out clever alternatives to the power problem. One idea is to create what are essentially chemical rockets: cylindrical microbots loaded with “fuel”—often a metal or other catalyst—that reacts with gastric juices or other liquids to expel bubbles from the back of the tube. “These motors are hard to control,” say Medina-Sánchez and Schmidt. We can roughly control their direction using chemical gradients, but they don’t have enough endurance and efficacy. Designing non-toxic fuels based on the body’s supply—sugar, urea, or other physiological fluids—is also hard. An arguably better alternative is metallic physical motors that can be propelled by changes in magnetic fields. Martel, as demonstrated with his bead-in-a-pig experiment, was among the first to explore these propellers. The MRI machine is perfect for steering and imaging metallic microbot prototypes, explains Martel. The machine has several sets of magnetic coils: the main set magnetizes the microbot after it is injected into the bloodstream through a catheter. Then, by manipulating the gradient coils of the MRI, we can generate weak magnetic fields to nudge the microbot down blood vessels or other biological tubing. In subsequent experiments, Martel made iron-cobalt nanoparticles coated with a cancer drug and injected the tiny soldiers into rabbits. Using a computer program to automatically change the magnetic field, his team steered the bots to the target location. Although there were no tumors to kill in that particular study, Martel says similar designs could prove useful for liver cancers and other tumors with relatively large vessels. Why not smaller vessels? The problem is, again, power. Martel was only able to shrink the bot down to a few hundred micrometers—anything smaller required magnetic gradients so large that they disrupted neuronal firing in the brain. A more elegant solution is using biological motors that already exist in nature. Bacteria and sperm are both armed with whip-like tails that propel them naturally through the body’s convoluted tunnels and cavities to perform biological reactions. By combining mechanical bits with biological bits, the two components could give each other a boost when one is faltering. An example is the spermbot. Schmidt previously designed tiny metal helices that wrap around “lazy” sperm, giving them a mobility boost to reach the egg. Sperm could also be loaded with drugs, linked to a magnetic microstructure to treat cancers in the reproductive tract. Then there are specialized groups of bacteria called MC-1 that align themselves with Earth’s magnetic field. By generating a very weak field—just enough to overcome Earth’s—scientists can point the bacteria’s internal compass towards a new goal such as cancer. Unfortunately, drug-tagged MC-1 bacteria only survive in warm blood for roughly 40 minutes, and most aren’t strong enough to swim against the bloodstream. Martel envisions a hybrid system made of bacteria and fat-based bubbles. The bubbles, loaded with magnetic particles and bacteria, would be guided down larger blood vessels using strong magnetic fields until they smack into narrower ones. Upon impact, the bubbles would pop and release the swarms of bacteria to finish their journey, guided by weaker magnetic fields. While scientists have plenty of ideas for propellers, a main hurdle is tracking the microbots once they’re released into the body. Combining different types of imaging techniques may be the way forward. Ultrasound, MRI and infrared are all too slow to follow microbots operating deep within the body by themselves. However, combining light, sound, and electromagnetic waves could increase resolution and sensitivity. Ideally, an imaging method should be able to track micromotors 10 centimeters under the skin, in 3D and real-time, moving at minimum speeds of tens of micrometers per second, say Medina-Sánchez and Schmidt. Then there’s the question of what to do with the bots after they’ve finished their mission. Leaving them drifting inside the body could result in clots or other catastrophic side effects, such as metal poisoning. Driving the bots back to their starting point (mouth, eyes, and other natural orifices, for example) may be too tedious. Scientists are now exploring better options: expelling the bots naturally or making them out of biodegradable materials. The latter has another plus: if the materials are also sensitive to heat, pH, or other bodily factors, they can make autonomous biobots that operate without batteries. 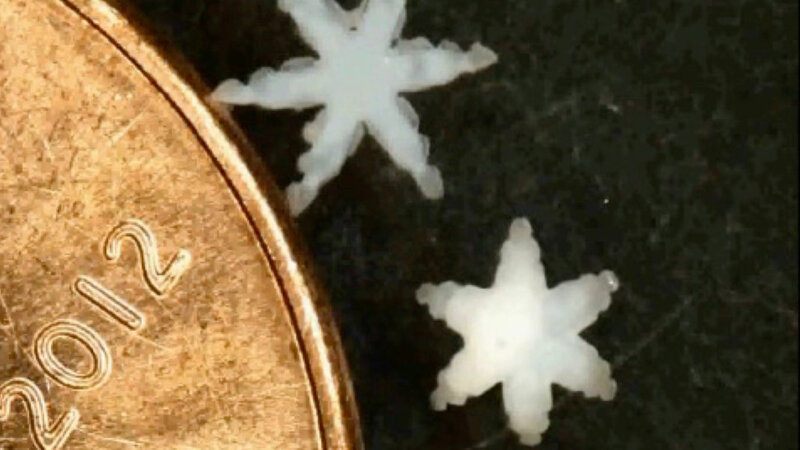 For example, scientists have already made little star-shaped “grippers” that close around tissues when exposed to heat. When placed around diseased organs or tissues, the grippers could perform on-site biopsies, offering a less invasive way to screen for colon cancers or monitor chronic inflammatory bowel disease. “The goal is a microbot that can sense, diagnose, and act autonomously, while people monitor it and retain control in case of malfunction,” say Medina-Sánchez and Schmidt. The medical microbot’s fantastic voyage is just beginning. All combinations of materials, microorganisms and microstructures need to be tested together for their behavior in animals first to ensure safety and function. Scientists are also waiting for regulators to catch up, and for clinicians to ponder new ways to deploy these new microbots in diagnostics and treatments. But optimism is growing in the ever-expanding field. “With a coordinated push, microbots could usher in an era of non-invasive therapies within a decade,” declare Medina-Sánchez and Schmidt. Banner image and video (“Self-Folding Thermo-Magnetically Responsive Soft Microgrippers) courtesy of ACS Applied Materials & Interfaces and licensed CC BY-NC.